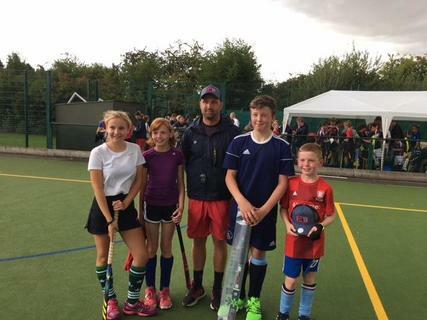 Around 50 boys and girls aged from 9 to 15 years were put through their paces by former England senior international Matt Taylor and his team of experienced coaches. These included Jamie Cachia (Scotland) and Mike Yeoman (Wales) and current junior internationals Josh Pavis (Great Britain u23) Alice Huddlestone and Ollie Rogerston (both England u21). Many of the participants were from the Spalding Club but there was also a good contingent from local Bourne/ Deeping HC and other local clubs. The young players tried out a series of skills exercises with a mixture of basic and more advanced techniques in their age groups. There were also plenty of innovative small sided games throughout including a workout in a brand new mini pitch which the players found hugely challenging and enjoyable. At the end of the two day camp, Matt Taylor and his coaches selected the following four players who they considered had made an outstanding impression.